As of this writing, there are 3,249 customer comments and 431 answered questions for the Lifetime Adjustable Folding Utility Table. I've read the customer feedback and then condensed the results into this review. I hope that this review helps you when you're shopping for the best outdoor table to add to your porch. The Lifetime Adjustable Folding Utility Table features a 48-inch x 24-inch molded tabletop (white granite) with a round folding frame (gray). This table has three adjustable height settings (24-inch, 29-inch, and 36-inch) and comes with a 2-year limited warranty. It has a stain-resistant surface so that you can easily clean it. In addition to being stain-resistant, this folding utility table has a rust-resistant frame and UV-protected high-density top. This outdoor table easily folds so that you can transport it with ease. Its foldability makes it easy to store as well. A nice feature is the carry handle which allows you to easily carry it from place to place. The Lifetime Adjustable Folding Utility Table can hold up to 800 pounds. It can be used as an indoor or outdoor table. Some people found that The Lifetime Adjustable Folding Utility Table worked well as a workbench. A customer explained, "Another great use for these tables: When painting or installing decorative shutters on the house these tables at their highest setting make a great temporary workbench to use outside for all of your needed tools. I found this lightweight table very handy for setting drills, screws, etc. when I installed plywood on my window before hurricane Irma hit Florida. I have a bad back so using the table reduced the need for me to bend down to pick up tools, etc. The tables are easy to move. I found it easy to pick one up (makeshift crossbar and all) and lift it over my head with the legs aiming to the sky then rest the tabletop on my head while I walked it to the place in my yard where I needed it. I'm no muscle man. I'm a 6 foot, overweight 64-year-old but I could easily handle putting the table top on my head. (I know. Bad visual. That's why there is no picture of me doing this!" A big selling point for this table is the fact that the height is adjustable. This is nice if you plan on using it for different jobs, or as one customer commented, she used it for her growing children. She said, "Bought this table for my 6-year old twins to use as a computer desk. The adjustable height was a selling point. As they grow up, I shouldn't have to buy another table for a long time (hopefully). It's not going to have a lot of weight on it, and it seems quite sturdy." The fact that this table adjusts is a nice feature. However, some people felt as if it was hard to adjust. A customer commented, "I dropped 1 star because of the awkwardness of raising and lowering the height. It really needs 3 hands to adjust each leg. For our use, it's not that big a deal, but if we were using it as a picnic table or something, it would get annoying really fast. You have to drop the height to the lowest setting for it to fold up cleanly. The integrated carry handle is really nice." Even though it is hard to adjust by yourself, the price is very good for this table. A customer commented, "This product is a mixture of awesome and aw heck. It is solid and perfectly sized. It is perfectly priced too. However, I really need three hands to operate it. To move legs up or down requires pushing in two opposite side locking buttons WHILE moving legs up/down. To fold legs in requires displacing securing brackets on opposite sides WHILE rotating legs in. Is doable with only two hands but...The simple answer is to use two hands and a foot." If you've ever toyed with the option of buying a tall desk that you can work from while standing, you may have noticed that they can be expensive. With a bit of tweeking, this desk may be high enough for some people to use as a standing desk when the legs are fully extended. A customer commented, "I work from my desk for long hours, and recently I've been experiencing back pain quite frequently. I decided to give the standing desk thing a try, but I wasn't going to spend $250+ on one. So I came up with the idea of just having a high desk, and a high stool to change my position throughout the day from standing to sitting. My old desk was very cheap and small, it needed an update. This folding table is a lot more durable, and it gives me enough room for my things. I bought a side table and put it underneath, where it holds my Mac mini and my CPU tower is on the floor. I have a floor mat for when I stand, and my high stool is tucked in under the table for when it's not in use. Keep in mind that the highest this table will go is 36in, I'm only 5"3 so it works well for me. My monitor is stacked on some books for now, but if you're taller, perhaps you could probably stack your equipment on something else to bring it higher up." Customers complained of no directions in the box. Make sure to look for a metal rod/tube clip when releasing the table. A customer explained, "I bought this as a laundry helper - folding clothes and such. Had a hard time opening this table. Zero information in the box? WTH? Got out a flashlight looking through the opening trying to figure out what has the table closed so tight and how do you open it. Finally just said to heck with it and got a large flathead screwdriver and popped it open. Lo & Behold a metal rod clip. A very seriously strong metal rod/tube clip. You could have made the picture of the table on the box half the size and put a piece of paper, ANYTHING, to tell me how and what was keeping the table closed !! Anyway, the table is open and perfect for the job. I am not sure if I should feel like a genius or an idiot right now." 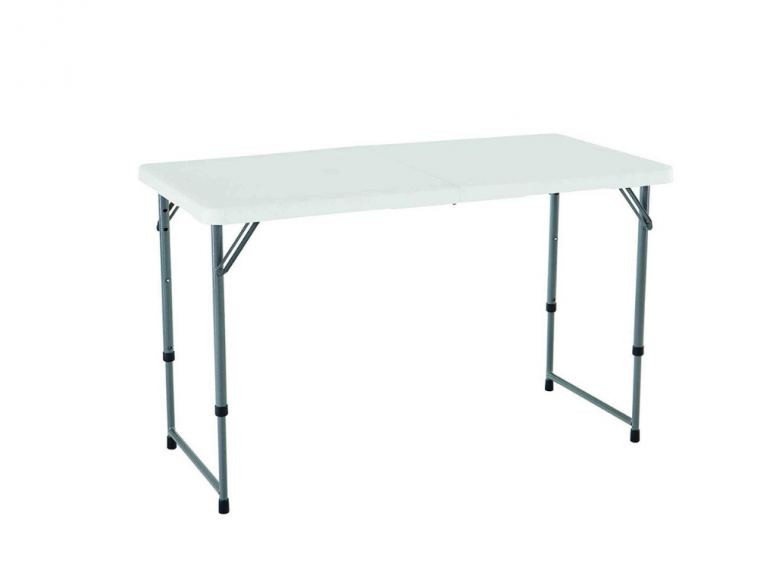 The Lifetime Adjustable Folding Utility Table is a 48-inch x 24-inch white granite table with a gray round folding frame. Featured are adjustable height settings (24-inch, 29-inch, and 36-inch). A stain-resistant surface means that you can easily clean it. This table has a rust-resistant frame and UV-protected high-density top. The Lifetime Adjustable Folding Utility Table folds so that you can transport it with ease. Its foldability makes it easy to store as well. A nice feature is the carry handle which allows you to easily carry it from place to place. The weight capacity for this folding utility table is 800 pounds. It can be used as an indoor or outdoor table. The Lifetime Adjustable Folding Utility Table comes with a 2-year limited warranty. Here are some top questions that I found for people considering buying the Lifetime Adjustable Folding Utility Table. How do you open this table? Stand it on edge with the hinge to the side, grasp the indents on the end and pull apart. Then make sure you lock it with the red lever. The legs can then be opened to their standing position. Once the table is standing press in on both buttons on one end. Hold the cross brace with your foot and lift to adjust the table height, and repeat on the other end. How much does this folding utility table weigh? This outdoor table weighs 20 pounds, but can easily be carried around with the carry handle. It folds in half, which makes it easy to transport and store. I want to put a microwave and toaster oven on this table. What is a good way to heatproof it for that? t should be fine to put a microwave/toaster on this table as long as you put a toaster separation pad underneath it. Avoid placing a direct heat source on or near the surface of the table because direct heat may cause damage to the table. The company sells an outdoor table that is heatproof, but you can use this table as long as you protect it with a pad.